Brrr! Can’t you feel that chill in the air? I can… but I think that’s cuz my heater’s not working. 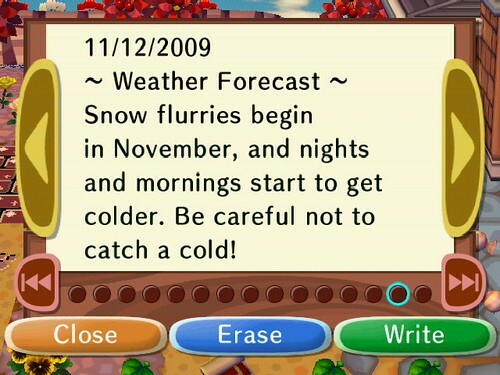 😛 I don’t really remember seeing snow at the end of last November in AC… but maybe I’m mistaken. Anyway, Squirt’s birthday is fast approaching. So of course he sent out jack-in-the-box’s to everyone in town. (I had like 12 of them in front of Town Hall.) I wonder who will bring Squirt his birthday cake? In other news, the day I’ve awaited for a long time has finally come. Elise is finally talking about leaving Shaolin! 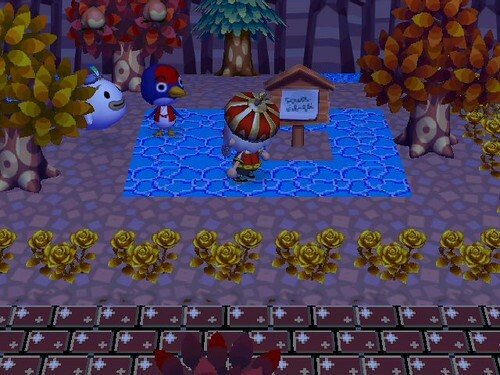 It only took weeks of ignoring her and burying pitfall seeds in front of her house. Sheesh! Yesterday, as [King] Squirt was wandering around town looking for a piece of Mushroom furniture, he noticed something shiny and yellow on the ground. An empty lamp! It’s been quite a while since I’d seen one of these around. So of course, later that night I logged in to find Wisp! Jay aint scared of no ghosts! I want a Ghost Butler! But I already have all the ‘stuff.’ My catalog is basically complete. I didn’t think it was likely that Wisp was going to give me a Nook Point item or anything special like that. I ended up choosing “Accessory,” with a small hope that Wisp might give me one of the very special colored Feathers that I still needed. But what did he give me? 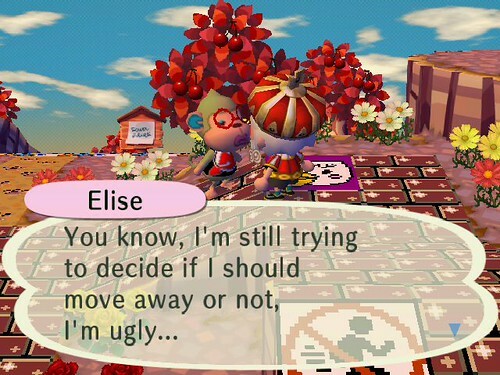 Elise… I believe she was one of those really rare characters in Wild World, right? Does that still apply? And if it’s possible, I’d love to come to your town! 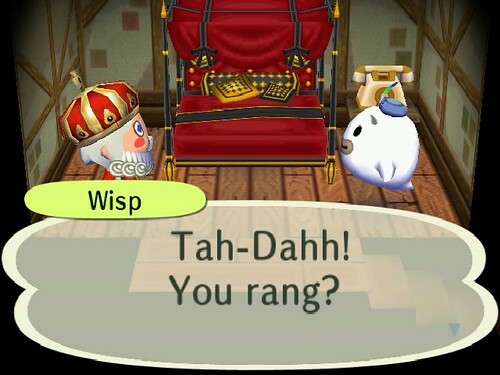 Anyway, I think that you wont be given any feathers from Wisp, mainly cos they’re an “achievement” or only gotten from a character imported from Wild World who has it.